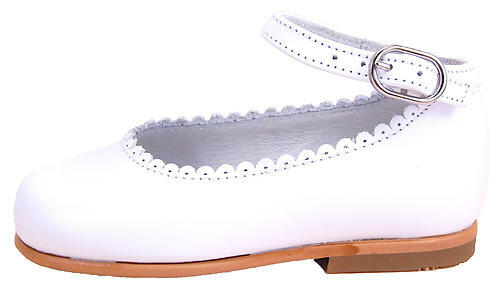 Dress anklestraps in premium white leather. Handcrafted in Spain using top quality materials. Full leather lining and insole with cushioned arch support. Internal "counters" for support and good wear. Leather substitute sole with slip-resistant finish. EU 18 (US 3) = 4 1/2"
EU 19 (US 4) = 4 3/4"
EU 20 (US 4.5) = 5"
EU 21 (US 5) = 5 1/4"
EU 22 (US 6) = 5 1/2"
EU 23 (US 6.5) = 5 3/4"
EU 24 (US 7 = 6"
EU 25 (US 6) = 6 1/4"
EU 26 (US 9) = 6 1/2"